Today I made vegan spelt gyoza for lunch and, I must say, they were delicious! I love dumplings. In fact many of my very favourite foods fall into the dumpling category, among them gnocchi and perogies. But until today I had never made gyoza before, let alone vegan spelt gyoza! Gyoza are the Japanese version of a dish originating in China called jiaozi. Often filled with pork and veggies, the filling is folded into a thin circular wrapper and sealed with crimped edges leaving a semi-circular shaped dumpling which is then boiled, steamed, pan fried, or even sometimes deep fried. The main difference between gyoza and jiaozi seems to be in the flavour of the filling and in the thickness of the wrapper, with gyoza commonly flavoured with soy and sesame oil and with jiaozi wrappers thicker than that of gyoza, but there are great regional differences which seem to make the line a little blurred. In using spelt for my take on the dish, the wrapper is a bit thicker than the gyoza wrappers that you can buy pre-made, which probably makes them closer to jiaozi. However, I decided to fill it with more commonly Japanese flavours using cabbage, shiitake mushrooms, soy and sesame, with a hint of ginger in there too. The process of making them was (despite the labour-intensive endeavor I’d envisaged) really easy! The dough is made by mixing together flour, hot water, and a pinch of salt, kneading it for a minute, and then leaving it to rest for half an hour to allow the gluten to relax a bit. To make the filling I took the supreme lazy-ladies route of putting everything in the food processor and blitzing it for a few seconds until it was all chopped up. It really was the work of minutes. To cook them I decided to half boil, half steam them by placing them into a shallow pan of water and leaving them to cook covered so that they would steam, for a few minutes. Once they were pretty well cooked I fried them in a tiny bit of oil to crisp up the outsides a bit. This method worked really well, but I’m sure that gently boiling them, or steaming them would work as well if you want to avoid frying them. When I was making the filling for these, I took a bit of a ‘throw stuff in and hope for the best’ kind of an approach, so when I first tasted the finished dish, I was delighted that they’d turned out so well. With the soy, miso, and the slightly meaty texture of the shiitake mushrooms they were rich with deep umami flavour. The nutty sesame taste from the oil, and chili heat from the dipping sauce complemented them beautifully to provide a really delicious and deeply satisfying dish! Now with delicious vegan spelt gyoza behind me, maybe it’s time to venture into perogi making next!! Spelt wrappers with a vegan filling of cabbage, shiitake mushrooms and flavoured with soy, miso and sesame oil. This satisfying and healthy dish is rich with umami flavour. To make the wrappers, measure the flour into a large bowl and add the salt. Stir to combine. Pour in the hot water and mix it until it comes together to form a rough dough. Turn it out onto a work surface and knead it for a minute or two until it forms a smooth, pliable but stiff dough. Add a tiny splash more water if the dough is too dry or crumbly. Form the dough into a ball and place it back into the bowl. Cover the bowl with a damp tea towel and leave it to sit for half an hour. Meanwhile, to make the filling, put all of the filling ingredients into a food processor and pulse it a few times until it’s all quite finely chopped and evenly combined. Conversely you could chop the mushrooms, cabbage, and spring onion until they’re all finely chopped, stir the soy sauce, miso, oil, and ginger together, and then stir the two parts together well. Once the dough is rested place it on a lightly floured surface and roll it out as thinly as you can while still keeping it strong enough to hold the filling. Cut eight to ten circles, 3 to 3 1/2 inches in diameter (I used the top of a pint glass and the size worked quite well) from the flattened dough. Working one at a time put a heaped tsp of the filling into the center of a wrapper. Wet one half of edge of the filling side of the circle and gently fold it in half around the filling. Carefully fold along one side of the semi circle so that the front is crimped onto a flat back. Press the crimps to the flat back to seal the dumpling and very gently plump it out at the bottom so that it can sit up right. Repeat with the remaining wrappers. Pour about 1/2 inch of water into a large frying pan with a well fitting lid. Place it over medium high heat and bring the water to simmer. Gently place the gyoza into the simmering water, upright if possible, and cover with the lid. Leave to simmer and steam for 10 minutes and then gently scoop out the gyoza with a slotted spoon. 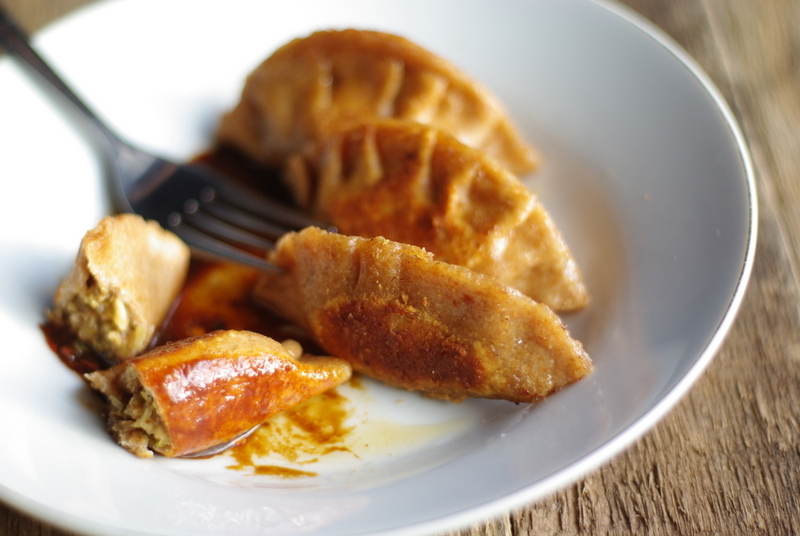 If you want them a bit crisp, heat up the remaining 2 tsp of oil in a large frying pan and place the cooked gyoza in. Let cook on one side for about 4 or 5 minutes until they’re crispy nd golden, and then flip them over to brown on the other side. Repeat until they’ve crisped up to your liking. To make the sauce mix all of the sauce ingredients in a small bowl until the sauce is smooth. 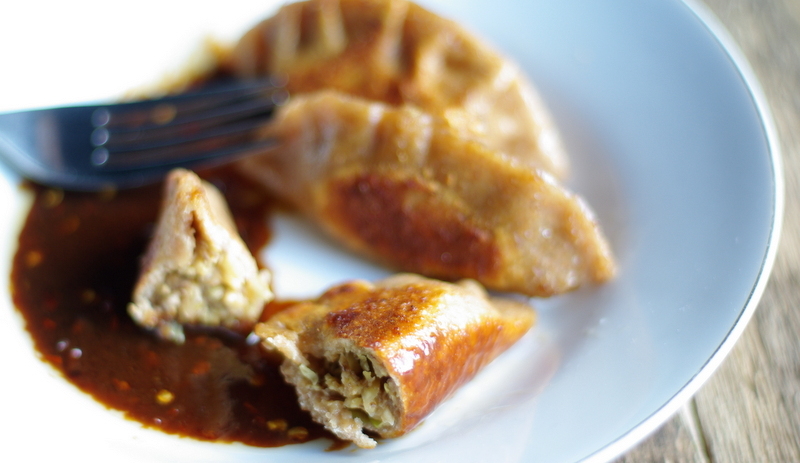 Serve the gyoza hot with the sauce on the side.